I haven’t kept up my winter hiking routine the past few years like I should but I thought today was as good of a day as any to start some spring training! The mountain behind our home is called Smith Mountain and there is a lot of history there and I keep intending to take the time to make a post about Smith Mountain and the hiking starting right here from Minam. It deserves a good writeup, but today is not the day for it. For today, just a few pictures. 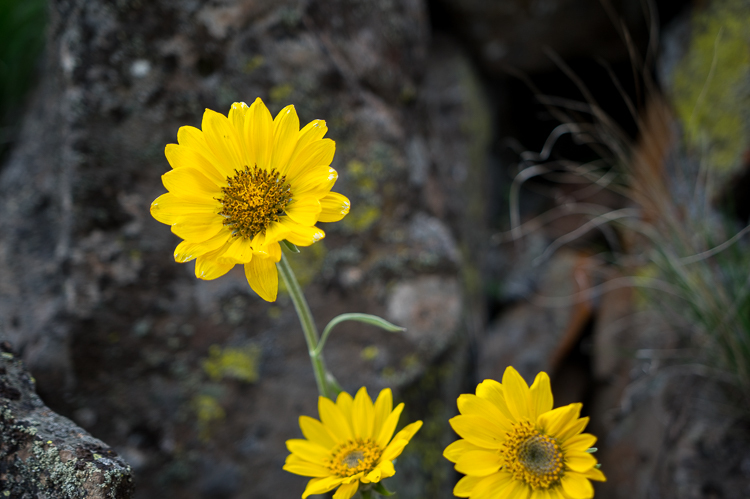 The balsamroot is finally blooming at Minam. We also have a good supply of different Lomatium species that bloom at Minam. Minam itself is an Anglicization of the Nez Perce word Eminamah which refers to the place where this plant grew in great abundance. Clearly the different species of lomatium were important to the Nez Perce if they would name this place specifically after the plant that grows and blooms here first in the spring. We have at least 3 different species of Lomatium that grow here at Minam (Lomatium dissectum is a fourth or fifth). Lomatium grayi, or Gray’s Biscuitroot prefers the steep rocky slopes and digging up the long tubular roots, you will notice a very carrot like taste if you ever eat them, but sweeter than a carrot. Lomatium couse, or simply Couse seems to grow up on the flats a little more and is very, very small compared to Gray’s Biscuitroot. The leaves are substantially different as well, but the size alone can often signal which plant you are looking at. Couse has a bulb type root and eaten raw has a very mild nutty flavor. We took some home last spring and sauteed them which made it taste a whole lot like a tasty fried potato. 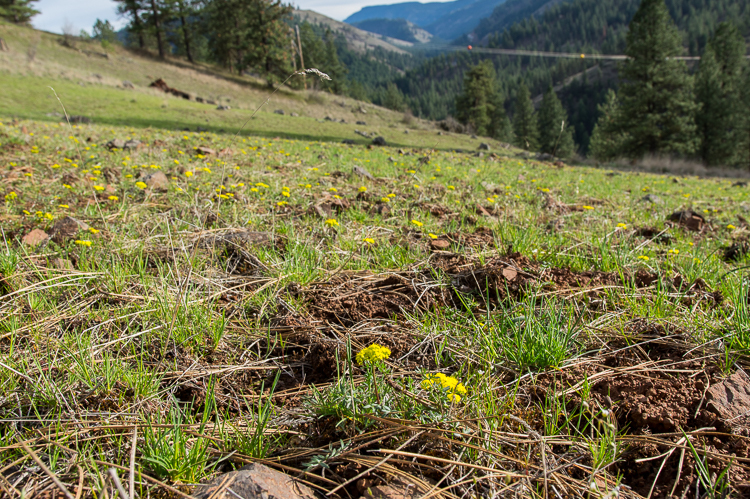 Here is a shot of the low growing Lomatium couse. We get big beds of them and the Nez Perce used to dry the bulbs and make very large biscuit’s that would last years in a food cache. Those darn power lines in the background often get in my way of taking photos at Minam. Anyway, look for the small fields of yellow flowers when you are trying to find some couse to dig! There is a third species of Lomatium that I have a hard time identifying. It is either Lomatium triternatum or Lomatium ambiguum. Or we have both, because sometimes I think the plant I am seeing is definitely one or the other. Either way this other species may also be put to good use. The leaves and flowers were dried in June and used to flavor meats. This species also has a bulb type root. I ate one the other day and it wasn’t bad, but not as tasty as couse. From my reading, the word couse was used by the Nez Perce to describe several different species of lomatium that was used for biscuit making. So perhaps all of them can be dug and eaten, but some will taste better than others. This family of plants also deserves its own post and a good assortment of pictures, but that will have to wait for another day. I will leave you with a picture from the side of the original Smith Mountain Road looking down at Minam. This road was built by A.C. Smith in the late 1800’s and marked the first real white man incursion into the Wallowa Valley. Hopefully I can find time to tell you more about A.C. Smith at a later date. This entry was posted in Day Hikes, Minam. Bookmark the permalink. Started running your river in 1968 always staying at the Minam motel. Never knew about Lomatium, always just thought they were pretty yellow flowers. Thanks for the interesting story behind them and for your river reports. If we did not live on the coast I would be making more trips in your neck of the woods.